The short answer? No. Not in the way that a popular animated gif insinuates, at least. If you’re even a casual space fan you may have seen a viral gif animation showing our solar system traveling through space, the motions of the planets tracing corkscrew “vortex” paths around a line-driving Sun. While it’s definitely intriguing to watch (in that mesmerizingly-repetitive gif fashion) and rendered with a talented flair for design, there are two fundamental problems with it. One: it’s not entirely correct, scientifically, and two: its creator’s intention is to illustrate a decidedly un-scientific point of view about the Solar System and the Universe as a whole. For the long answer, I now offer up the stage to astrophysicist Rhys Taylor, who recently posted an in-depth article describing why the planets do yet move… just not like that. There’s this annoying space GIF roaming the internet causing trouble. Perhaps you’ve seen it. No ? Well, here it is. What it purports to show is the motion of the Solar System through space. But the accuracy of this has been utterly derided as an affront to scientific dignity. Which is a shame, because the video version is really quite nicely done, with good camera movement and a catchy soundtrack. The principle antagonist is notorious “Bad Astronomer” Phil Plait, who wrote a convincing and virulent attack on the video. I decided to investigate for myself. It seems to me that the appearance of the Sun leading the planets in the gif is just the result of a projection effect – i.e. that things can look different from different angles. On the other hand, Plait read the source material for Sadhu’s model, so maybe there’s something in there that’s more explicit. I’ve glanced at it, but couldn’t find anything stating this precisely. Actually I couldn’t find a whole lot that was even vaguely coherent, but we’ll return to this later. For now, just keep in mind that Sadhu is using an alternative model, even though that may not always be evident. There can be no mistaking that Sadhu’s video shows the orbits with the wrong tilt. But is that so critical? Well actually no, not really. 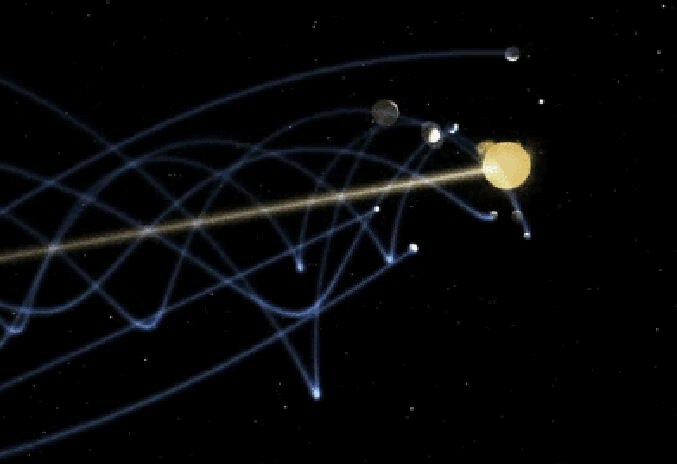 Fact is that if you include the tilt, you still see the planets making a “spiral” pattern (technically it’s a helix) as they move through space. The overall appearance just isn’t that massively different compared to a 90-degree tilt. So what’s the big deal? What does the author claim in this internet sensation that’s so outrageous? Well, not much. That particular video/gif are actually fairly inoffensive, to my mind. The most basic notion that the planets trace helical paths through space is perfectly correct. What honestly surprises me is that this is so incredibly popular on the internet. If you weren’t aware that the Sun orbits the center of the galaxy — which, since the planets orbit it, necessitates that they trace out helical paths — then the education system has seriously failed. But do not despair! This can be remedied very, very easily. *Yes, they are. Plait notes: “They’re different in more than just name; they’re actually very different physical motions with different properties—you can get helical motion without the particles in it interacting, like in the solar system, but in a vortex the particles interact through drag and friction.” Basically, claiming that the Solar System is a vortex is simply wrong. Sadhu appears not to have checked the word “vortex” in a dictionary. I could forgive even these rather hippyish sentiments, if they were no more than that. Alas, they’re symptomatic of a much larger problem. Plait’s merciless attack is full of sound and fury, but it’s also signifying something. Reading more of the author’s website, it turns out he is actively promoting quackery. It’s on a par with the excellent Space Mirror Mystery* (the idea that everything further away than about 150 million km is just a reflection in a giant mirror), but less funny. *I was delighted to find that this website is back online. Seriously, read it. It’s epic. Apparently he thinks this is a problem. Worryingly, it suggests that he didn’t show the 60-degree orbital tilt not for mere simplicity, but because he doesn’t believe it’s possible. Which — if true — is utter madness, pure and simple. There’s absolutely no reason the planetary speeds have to be constant as they move around the galaxy — the massive gravitational pull of the Sun is keeping them firmly in its orbit, regardless of how those orbits are inclined. Fine. The heliocentric model isn’t flat, which perfectly explains why planets aren’t eclipsed by the Sun once per year. What need to state this ? Is he really saying that this is a problem in a heliocentric model…? SERIOUSLY? Planets trace a helical path in space because our Solar System is orbiting the center of the galaxy. Big bloody deal. It’s that simple. You don’t need a wacky alternative model of the Solar System for this – it’s happening anyway! As for going on a journey though – well no, not really. Every other star is also orbiting the center of the galaxy, so no, we’re not actually getting anywhere relative to other star systems. None of which changes the fact that his first video/gif has only minor inaccuracies, but at this point I can’t help feeling that this was more by luck than judgement. Then there’s his second video. This one is more objectively just plain wrong. He shows the Sun tracing out a corkscrew pattern as it orbits the galaxy, which makes no sense. The Sun simply goes around the center of the galaxy (and up and down a little bit) — nothing else. It’s not orbiting anything else at the same time. For it to trace a helix is just nonsense. He seems to have an almost unique case of helix madness. What of the source material — the alternative model Sadhu uses? Garbage. Utter garbage. I find it difficult to read more than a sentence or two, because it’s verging on incomprehensible. As in almost at the level of TimeCube. – An absolute time that is universal and has neither a known starting point nor an end point; not even limited to a measurable parameter. – For living organisms there is a time for birth and a moment for death. The interval is the life span. This time may be measured with parameters like seconds, minutes, days and so on. Mechanical devices may measure fractions and to some extant reliable. In every case some kind of energy source or gear system is involved. Well of course it hasn’t — it’s complete gibberish ! Plait may well be right that somewhere in this mess is a model wherein the Sun leads the planets, but I don’t have the time or sheer mental fortitude to read the whole thing. I will note, though, that there’s a paragraph where the author rubbishes the conventional explanation for the ozone hole — and God help us all if that goes viral. That, not petty disputes about whether the orbits of planets are tilted by 60 or 90 degrees, is why such quackery deserves to be shot down without mercy. In conclusion then, the first video and gif of the Solar System as a “vortex” are not really all that bad. Unfortunately, the inaccuracies are not due to some minor over-simplifications, but are symptoms of a some very deep-seated misunderstandings. 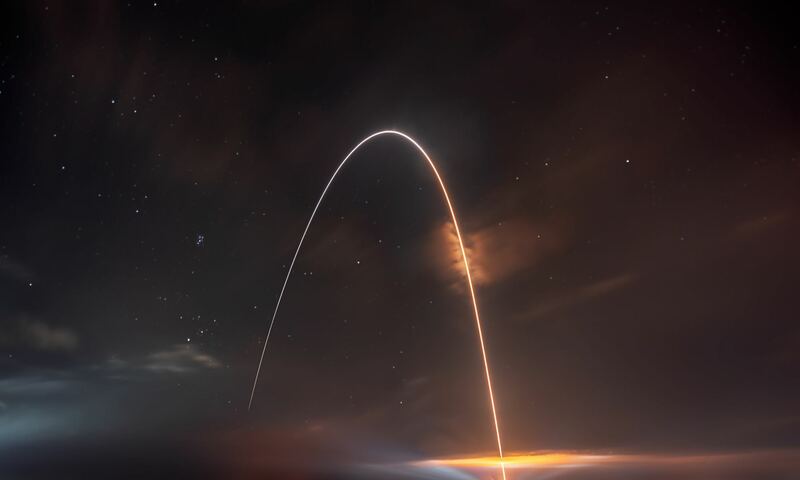 My feeling is that if your take-home message was only that the Solar System moves through space, and the planets trace out pretty spirally paths, then all is well and no harm done. But if it’s leading you to question the heliocentric model, then we’re all buggered. Thanks to Rhys Taylor for the guest post of his entertaining and informative article — at the very least, you got to watch “The Galaxy Song” again! Read more from Rhys (and check out some really nice infographics too) on his blog here.